We have a ham bone left after Easter dinner, so I thought we would have a bean soup for the crock. 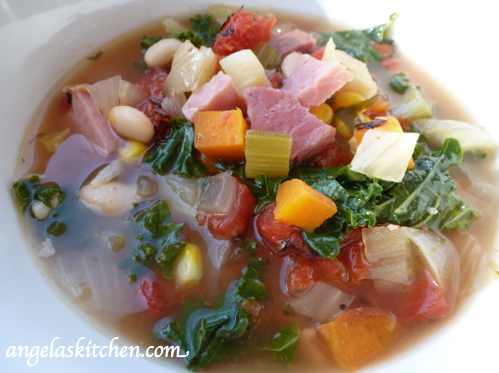 This was so delicious and comforting- hearty enough to be a main dish and warm enough for a chilly Spring evening. Combine ham bone, water, chicken broth, garlic, onion, carrots, celery, fennel, pepper, parsley, and thyme in a slow cooker. Cover and cook on low for 6 - 7 hours. Remove ham bone and cut meat from the bone and dice. Skim fat off the top of the soup and add the ham, along with the extra ham, if using. Add corn, spinach or kale greens, beans, and tomatoes. Cover and cook on high for one hour. Taste and add salt and pepper, if needed.